Introducing our new Charge Pipe for the 2012+ BMW 320i, 328i N20 Single Turbo Engine, 2013+ BMW 428i N20 Single Turbo Engine and 2014+ BMW 228i N20 Single Turbo Engine! Throttle body matched 2.75" piping. Retains factory style o-ring throttle body lock flange. Precision CNC machined throttle body flange ensures leak free connection to throttle body. Quick and easy connection and disconnection to throttle body. Ideal connection compared to the silicone hose and hose clamp connection found in all other aftermarket charge pipe upgrade pipes available in the marketplace. Includes two 1/8" NPT Bungs (comes pre-capped) - For methanol injection or as a boost source. Turn up the boost with a tune and find your $400 factory charge pipe break apart? Fear not! The solution is here! Replace it with a higher flowing, stronger aluminum charge pipe! Made 100% of 6061 high grade aluminum, this will never happen again (backed by our Limited Lifetime Warranty)! Often ignored, charged intake airflow characteristics greatly affect throttle response, turbo lag and ultimately maximum power potential. Smooth bends and minimal obstructions are ideal. We used 6061 aluminum (lightweight) mandrel bent piping to ensure smooth transitions. The upper pipe features 2.75" piping to match up to the factory throttle body (factory pipe is 2.5"), ensuring maximum flow without obstruction. We were the first manufacturer to duplicate the factory throttle body flange with our N54 charge pipe. We bring the same thing to the N20 charge pipe. During our research and development, the connection at the throttle body was looked over very carefully. The factory charge pipe is connected to the throttle body using an o-ring inside the throttle body flange which is locked in place by a c-clip, which works very well. It also make removal/installation quick and easy. Our testing had shown it could hold quite a bit of boost. During our testing, we had pressure tested this connection up to 25 PSI. The reason why we stopped at 25 PSI was because at 25 PSI, one of the intake pipes on the turbo blew off and we could not test any higher. Hoewver, we were confident that it would easily hold over 25 PSI as the throttle body flange showed no signs of failing. Also, keep in mind, this type of connection is used throughout the engine, in many crutial areas like the coolant radiator system as well as the clutch system. If BMW did not believe in the durability of this type of connection, they would not use it in such important areas. The charge pipe kit for the F30 N20 engine features two charge pipes, the upper and lower charge pipes. Both charge pipes are included in the kit and are required for installation. 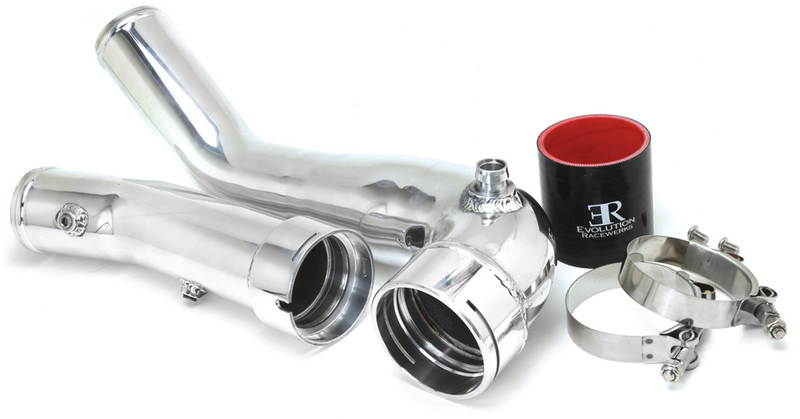 Our Charge Pipe is available in the same 3 finish options as our intercoolers. It is available in brush (plain) or mirror polish finish standard. It is also available in our Type III Hard Black Anodizing for the stealthy, factory look. An added benefit of the Type III Hard Black Anodizing is that it hardens the aluminum piping and makes it more durable against damage (like dropping the pipe). With the popularity of methanol injection systems and nitrous systems, we have added the option of having a 1/8" NPT threaded bung (for methanol or nos injectors) welded to our diverter valve charge pipe. This allows quick and easy installation of methanol/nitrous injectors that are used in methanol injection systems and nitrous systems. Our charges pipes come with 2 meth bungs standard (you can custom order only 1 or none). Each 1/8" NPT bung will come with a plug so that you can run with or without the methanol injector. This is perfect for those who do not have the Methanol Injection yet but plan to do so in the future. Note - For customers who have the Aquamist Methanol Injection Kit, Aquamist injectors use a 8mmx0.75 thread pitch instead of the 1/8" NPT standard that every other brand uses. If you have an Aquamist Methanol Kit, no worries! We have bungs made specifically for the Aquamist. Specify below if you need Aquamist bungs. Since this affects a very low amount of people, they will be custom made for you and not be regularly stocked. Also, we do not have plugs for these bungs. You will have to already have the Aquamist kit. Add our new Turbo to Intercooler (TIC) Pipe to your Charge Pipe Kit and you will have full metal hard piping throughout your entire intercooler system. The TIC Pipe Kit is discounted when purchased with the Charge Pipe Kit! For more information about the Charge Pipe Kit, click here.